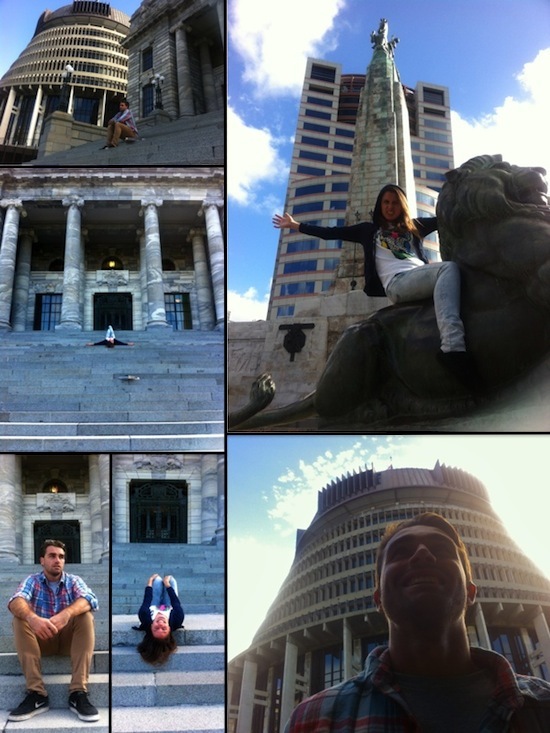 In just 7 days, I have seen more of New Zealand than in the past two months. What was the occasion? Alexander James was in town! I took some time off from work and Alex and I hit the road. Well, first we hit the streets of Wellington. In a nutshell, Zealandia was dinosaur playland, the Te Papa Museum was a snooze fest, the bee hive is the bee hive and the waterfront is much more fun when you’re drinking cold beer. If you ever find yourself in Wellington, I’d say Zealandia is worth a look. 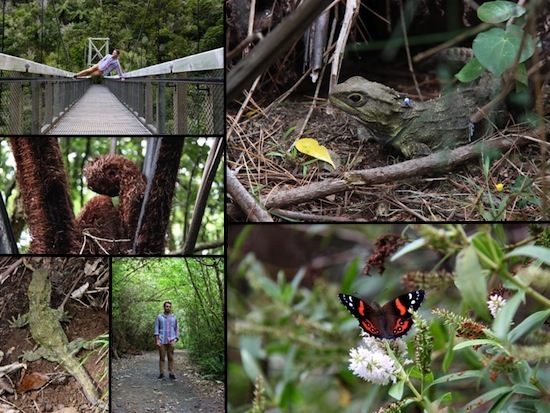 Mostly I am head over heels for tuatara and they are one of the reasons I’ve always dreamed of coming to New Zealand. First of all, they aren’t lizards. They are tuatara, a species all their own with a distinct lineage dating back to the Mesozoic. Their name comes from the native Maori word meaning “peaks on back.” Did you know a single breath can last for an hour? Rumor has it that these living fossils can even survive for up to 200 years! They are beautiful little dinosaur angels and I love them. If you go to Zealandia, you get to see them in the wild. I tried to catch one. They’re deceptively quick. If you just want to go for a wander in Welly, I’d say the best thing to do is walk along the waterfront and then head up to parliament. The Bee Hive is kind of cool if you like boring, government stuff, which in fact, Alex does. 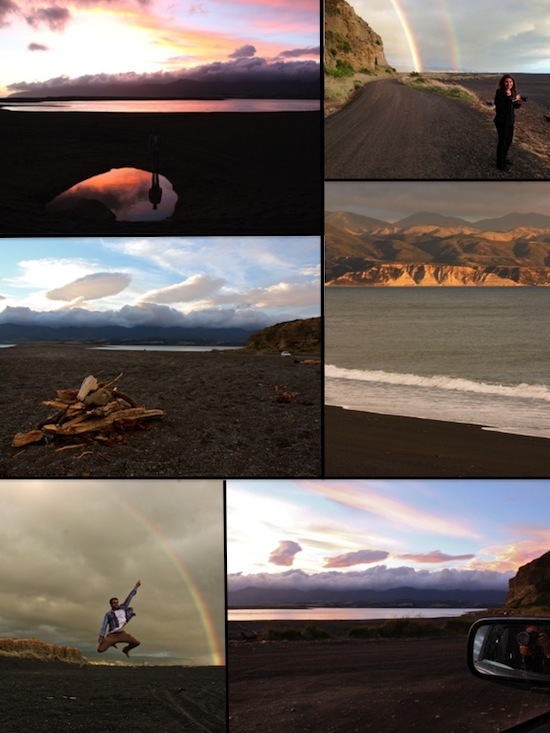 After Alex’s brief introduction to Windy Wellington, we hit the road and headed to the Wairarapa. Without knowing anything at all about the area, including how to say its name, Alex and I caught the train to Featherston and hopped on the next bus to Martinborough. We had been invited to stay in Ruakokoputuna for three days and three nights with the family of a Kiwi friend who worked with Alex back in Australia. I had absolutely no idea what to expect. All they told us was, “You’ll be staying in the little, red hut and you’re welcome to borrow the car to do some exploring.” We got way more than we bargained for in the best kind of way. Patuna Farm was a classic New Zealand dreamscape. Think of a pretty white house with a deck wrapping around the corner and overlooking the sprawling lawns and rolling hills beyond. Chooks and ducks and sheep and emus pecking and squeaking and parading in the fields behind the shed. An old, faithful hound, Igloo, sleeping on the porch, occasionally waking to roam the grounds and shoe the ducks back under the fence and into their grassy pastures. Picture a short, dirt road shaded by a row of trees that leads to a beautiful little, red guest hut next to the horse pastures. This scene takes shape in the heart of postcard paradise: An endless sea of sloping hillside, deep green pine trees and waves of golden grass stretching into the distance. It was a living, breathing page right out of a storybook. Alison and Alan welcomed us to their farm with open arms and ear-to-ear smiles. We drank wine on the porch and then sat down for a hot dinner that was prepared by a lovely German couple working on the farm. By the end of the evening, we had the next day’s itinerary sorted. “You absolutely have to walk the chasm. You can’t leave without doing it.” And so, the next day, we ventured into the Patuna Chasm. 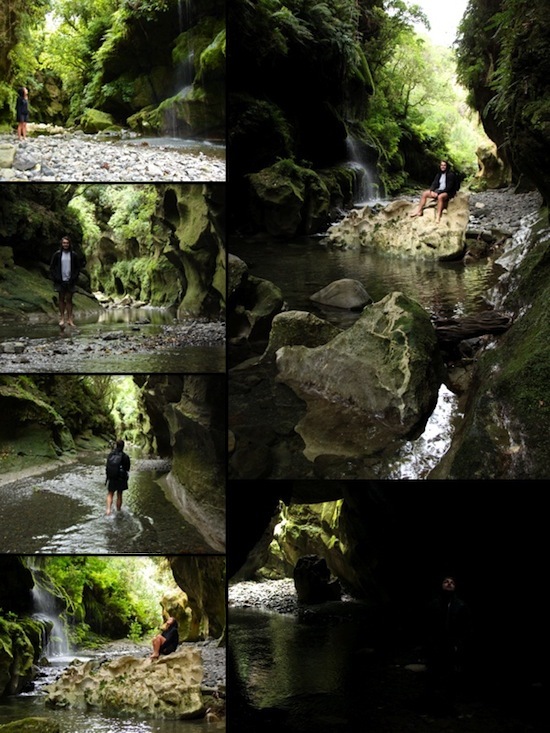 The beauty of the hike is that not only do you get to explore the gorge, but you get to explore every facet of the Wairarapa landscape. Our journey began with a trail through the pine forests that lead us right into the grazing pastures. We crept along the fence posts trying not to disturb the sheep and cows who stood quietly chewing bits of grass, occasionally turning their heads to watch us pass by. 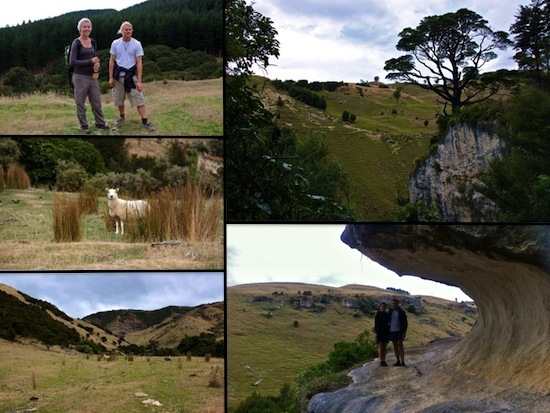 We trekked across the farmland and into the native bush where we hiked through winding trails of fern and forest. We stopped at the wave rock and snacked on fresh passion fruit, cheeses, crackers and apples with a V.I.P view of the steep, sweeping countryside beyond. Then we came to marker 19 which signified the entrance into the heart of the chasm. Through a series of ropes and ladders, we descended into the deepest point of our journey and chased the river down stream where we found ourselves in limestone paradise. Within the chasm, the rock walls were growing green with life and trickling waterfalls of moss and fern glittered in the sunlight. At it’s most narrow point, the chasm blocks the sunlight, and you have to wander blindly into the dark fortress. It makes your heart beat a little faster – it’s exciting. It only stretches for a few meters, and on either side you can see the gleaming river welcoming you back into the sunlight, but it’s a sensory rush for those few precious moments when you can’t see your own feet on the ground below. If it weren’t for the icy water trickling over your toes, you might think you were floating. 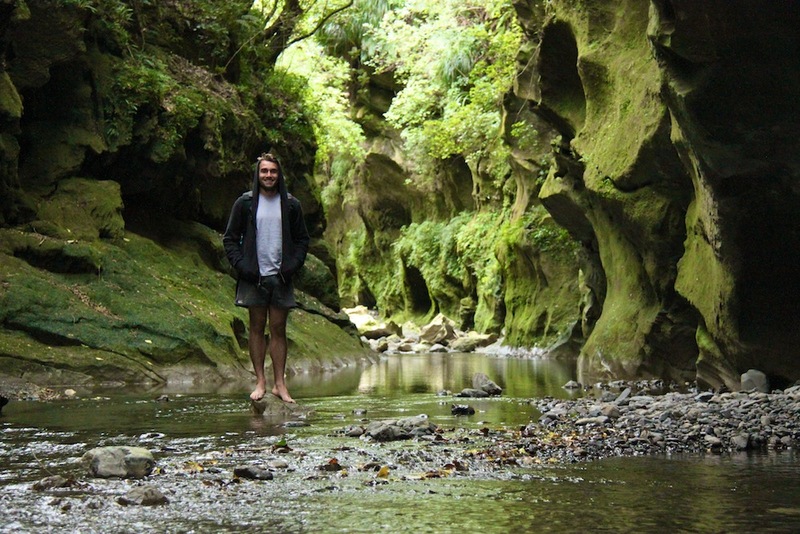 That’s the other thing about the chasm – the whole trek is a splash course down the river. Alison and Alan gave us fair warning that we would get wet, and indeed we did. It wasn’t a particularly hot day, and it’s a safe bet that it was the coldest water I’ve ever encountered in all my 25 years, but it was the only way to experience the chasm. Near the end my feet were numb and my shoes were filled with pebbles, but all I could do was smile. At the very end of the four hour hike, you can choose to abandon the river and return to dry land, or you can finish like a champion and swim your way out through the deepest part of the river. And so, I stripped down to my undies and put my game face on. It was only a five meter swim, but let me tell you, that’s all you need. My skin burned and my bones ached as I swam the measly distance out of the chasm. I stumbled out of the icy river with a jack-o-lantern grin. My heart was bouncing in my chest and my whole body tingled. I turned back to face the chasm. That was one hell of a trip! There’s a lot of other fun stuff to do besides hiking the countryside though. Alex and I took a quick trip to Lake Ferry in search of some of the best fush & chups around. We found them, and we also ended up getting more than we bargained for, in the best kind of way. As if a sunset over a black sand beach with seals flopping around and golden light bouncing off of the cliffs beyond isn’t beautiful enough, the clouds decided to send down a rainbow. Cheeseball paradiso. On a whim, we also decided to drive to Castle Point for the afternoon, a rugged, powerful coastline just an hour and a half from Martinborough. 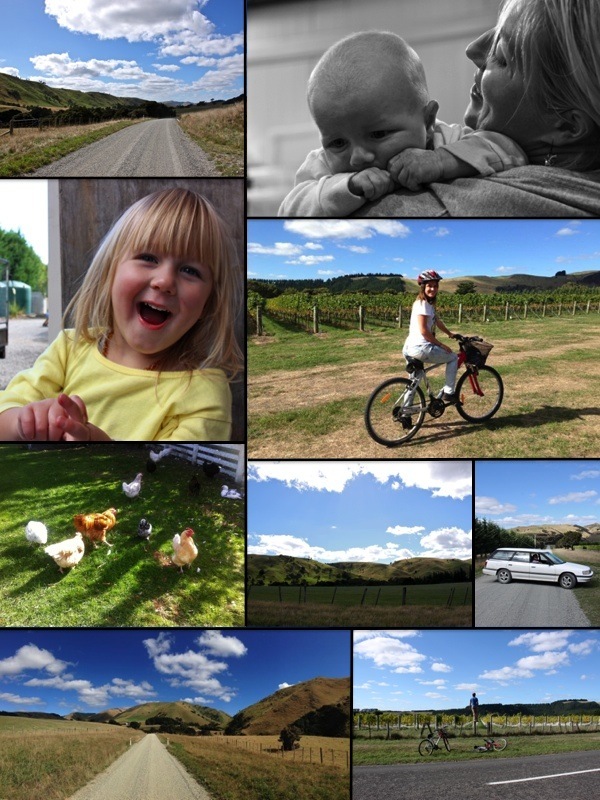 Of course, we also spent some time in Martinborough itself. We drank some lovely wine from the Coney vinyard and enjoyed a few tasty meals in town. On our last day we had an hour to kill before the bus arrived, so we cheesed it up and rented a couple of push bikes. Like a couple of dorky tourists, we pedaled around the outskirts of town, me lugging my camera around in the bike basket and Alex acting like a typical boy. You know, jumping over stuff, no hands – generally annoying, unnecessarily risky stuff. We both wore helmets. I miss the Wairarapa already. 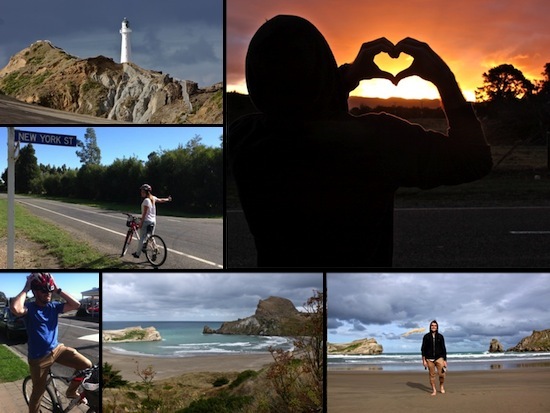 It was a sad affair when this little trip came to an end, but there is plenty more to come once I’ve saved up enough coin for a proper New Zealand roadie.